I had Adductor Spasmodic Dysphonia (AD-SD) and underwent the Selective Laryngeal Adductor Denervation - Reinnervation (SLAD-R or "De-Re") procedure at UCLA Medical Center in Feb 2011. It was performed by Dr. Berke and his team. 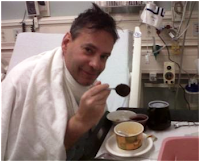 This surgical journal blog charts my experience starting from a few days before surgery and through my ongoing recovery. a little overboard with the Thick-It! They brought me breakfast, consisting of clear liquids: chicken soup, grape juice and tea. I added Thick-It to everything. Note that they’re quite stingy with the Thick-It packets at the hospital so I had to keep ordering more. They would bring me 3 packets per meal when I needed about 10. Word to the wise: have someone sneak your own can of Thick-It into the hospital just in case. At first it was a bit tricky to swallow but I managed to get through breakfast. Dr. Berke stopped by and showed me a few tricks to help swallow, which helped. Lunch and dinner (with similar “cuisine”) got a bit easier. Definitely can’t drink fluids, so the Thick-It is important. 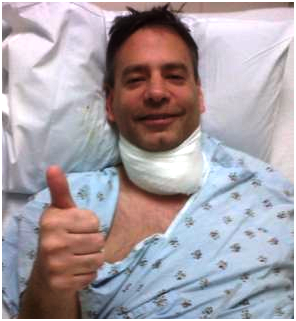 The residents came in and removed my compression bandage and replaced it with a large piece of gauze wrapped around my neck. It’s not uncomfortable. With the help of a nurse, I walked around quite a bit on the first day. My voice is about the same as day 1: weak and croaky, and the croakiness is more pronounced if I have a little fluid/phlegm in my throat. I had a headache at one point, but no pain at the point of surgery. I was transferred to a private room finally. The private rooms at UCLA Medical Center are quite nice, and feature both a couch and a reclining chair for family or friends that want to visit. There are no visiting hours at UCLA Medical Center; family and friends are welcome around the clock. I got a little more sleep the second night, but still using the suction, and/or tissues to deal with the phlegm. They gave me some liquid Colace (stool softener -- typical after general anesthesia) which I mixed into some thickened water – it tasted terrible. I read on Scott Adam's blog (he’s the Dilbert creator that had the same operation a while back) that the first two weeks would be “highly unpleasant.” I found the first day to be somewhat unpleasant, certainly not “highly unpleasant.” In fact, the most unpleasant thing was eating that horrible tasting Colace mixture – the other stuff wasn’t all that bad, maybe just because I was expecting it to be worse. And live with my boyfriend in Belgium, but I am from UK. I was diagnosed in 2012 with cervical dystonia. Doctors told me this condition was forever. I know how you feel and what you are going through, I just want to tell you that I am cured now,with the help of doctor williams herbal medication, the last time I can remember having cervical dystonia was in the summer of 2016. It was a long and difficult process but I am so thankful to dr williams I don't have it anymore. Please know you can be cured too. Accept what happened and is happening to you, forgive, let the past go, love yourself and others unconditionally and be thankful. Everything happens for a reason. If you want to get in contact with dr williams and share your own testimony and thoughts feel free to e-mail him on; drwilliams098675@gmail.com for advice and for his product. ADSD since 1993. SLAD-R surgery in 2011. SD now a distant memory! The purpose of this blog is solely to document and share my personal experience with SLAD/R surgery. It is not intended as a recommendation or endorsement of any medical procedure or team. SLAD/R is major surgery and other treatment options should also be considered by patients with spasmodic dysphonia.